Indeed, and became highly frustrating as a viewer. Of all the TOS races the Klingons interested me the least during Berman era. Even DS9 didn't make them interesting. It all felt very repetitious and uninspired. I know I'm in the minority on make up and use of the Klingon language, but I will take that over more discussion over "honor" and the like. I wanted to feel more invested in this alien culture not stereotyping. Discovery did that. While I liked the TNG/DS9 Klingons, that's specifically 24th Century Klingons. So I'm glad they didn't go this route with the Disco Klingons. It's also interesting when people say the Klingons have been overused. Once upon a time, that might've been true. But they weren't the main focus since DS9's fourth season in 1996 and they weren't the main focus of a film since TUC in 1991. Not to say they weren't a focus at all in late-DS9, some of ENT, or stray episodes of VOY, but the main antagonist of a season or film? That hadn't been done in a loooooooong time. And, like we've said, the DSC Klingons aren't the TNG/DS9 Klingons. JoeP, The Mighty Monkey of Mim, Tuskin38 and 1 other person like this. The DSC Klingons still have some TNG/DS9 flavour to them while adding on top. The Mighty Monkey of Mim and Lord Garth like this. I don't think the paint is just a matter of aesthetics; it probably has a rich background of lore and deep and nuanced significance going back quite a long time. JoeP, Lord Garth, Burning Hearts of Qo'nOs and 1 other person like this. You really haven't heard Kiss untill you've heard them in the original Klingon. OCD Geek, Alan Roi, saddestmoon and 8 others like this. One of the advantages of not having the Captain be the main character is that you can change out who the Captain is every season. Pike being in the dark about Georgiou and Tyler, leading to some tension between Pike and Burnham, where Burnham will have to explain things to Pike that are off the official record. PiotrB, CommanderRaytas and XCV330 like this. In my opinion I like this break away from the Trek mold because it allows for more rotation of the crew, which, to my mind, is more realistic. JoeP, Lord Garth, Burning Hearts of Qo'nOs and 4 others like this. Yes. I've said this for years about the way the TV show presented the Enterprise D's view screen. As you wrote, and as your example shows, on several occasions throughout the series, when the production showed us a different angle of what our heroes were seeing on the view screen, the angle of what was visible on the view screen changed as well. I've always figured this was intentional, and was meant to allude to the idea that the main viewer could present holographic images. Oh yes, it was most assuredly intentional. 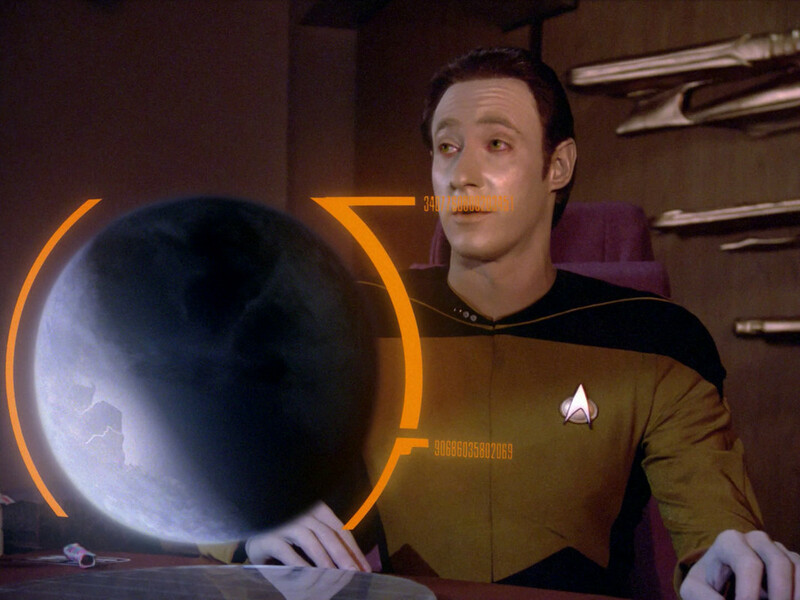 The Writers/Directors' Guide for TNG explicitly described it as "a large wall-sized holographic 'viewer.'" Makes eminently more sense to me than hypothesizing that if it appears equally capable of X, it must therefore also be equally capable of Y and Z, especially given that in this case X wasn't generally singled out as being a new or particularly impressive capability in the 24th century in the first place. Holodecks of the 24th century are capable of virtually anything (pun intended) from A through Z. (Albeit, this represents a set which ever expands—and occasionally contracts—at need or whim of a given plot.) Whether the earlier simulators of DSC and TAS be capable of A through M, or N through Z, or even A through Y, they don't represent the full and complete package, which is all "original intent" requires to maintain its precious integrity. 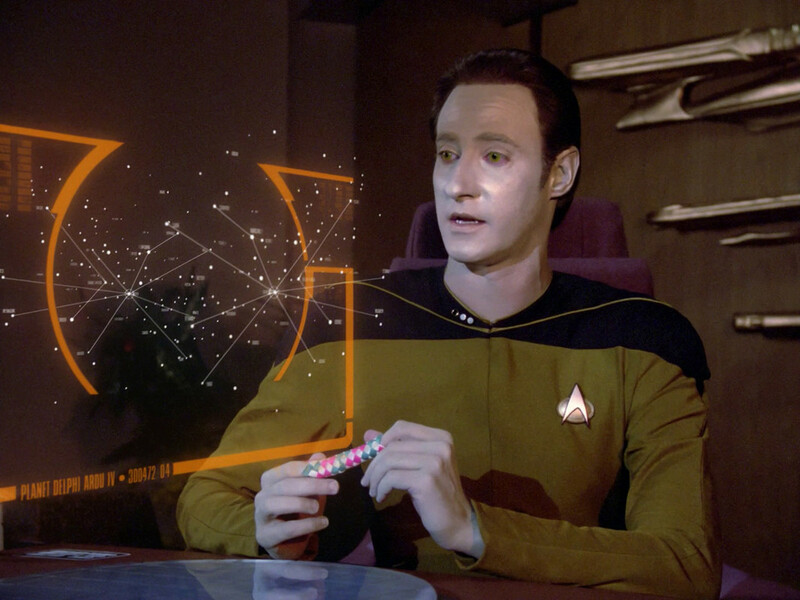 TNG's holodeck...was a concept refined from earlier Trek incarnations. I do not see anything DSC has shown as violating any of the above, irrespective of whether one might or might not consider any such violation an affront of any degree. If you look at the environments they look equally real. The environments aren't equally complex and varied, though. Simulating a series of corridors and some glorified clay pigeons (merely ones shaped like Klingons instead of little glowing balls like those in ENT) seems a far easier task than simulating with equal reality an entire forest (which was emphasized as "one of the simple patterns" in the TNG premiere) or city populated by hundreds or thousands of individual plants, animals, and/or intelligent characters, each of which can be interacted with separately, physically and conversationally, and respond in kind. That's what I was getting at, there. Here again, TNG's Writers/Directors' Guide could scarcely have placed greater emphasis than it did on the point that "HOLODECKS CAN SIMULATE ANY ENVIRONMENT"! Even if TAS and DSC could manage scores of them indifferently, dozens adequately, and a few superlatively to boot, that would still leave room for the TNG iteration to be deemed more advanced and impressive. The one that's not constrained within the area of the holo-emitter, a known vulnerability for 24th century holograms. It makes ample sense to me that they would elect to constrain the improved version to a small area, considering the mayhem that could result from a holo-image indistinguishable from the actual person (and presumably just as solid, like all 24th century holograms) being free to roam unfettered about your bridge. Vulnerability indeed! It might also be a way of conserving energy and processing power/bandwidth, which were the main obstacles to expanding the EMH's range beyond sickbay and the holodeck early on in VGR, before they were gifted with Starling's mobile emitter based on 29th century tech. If not for those constraints, they could readily have set up emitters virtually anywhere on the ship they wanted, as evidenced in "Persistence Of Vision" (VGR), "Basics, Part I" (VGR), "Before And After" (VGR), "The Killing Game" (VGR), et al. Note also that this particular planet had "been charted only from long-range scans," so of course there wouldn't be a bunch of named topographical landmarks and locations to display like there would be for Qo'noS. That's what I see in my own comparisons, anyway—again, allowing for variation and advancement in technology and technique where artistic portrayal is concerned, which is and always has been a necessity. (I'd file it all generally under "poetic license," with the added stipulation that earnest errors and missteps absolutely can and do occur from time to time.) Very little of Star Trek would seem remotely believable without, you guessed it, good old suspension of disbelief being decisively in play! We obviously aren't going to agree on this, and neither of us is going to "win" this argument, so by all means (short of vandalism of Memory Alpha to prove a point, that is) enjoy your own interpretation, as is your perfect right. In spite of your mischief elsewhere, I've genuinely had some good fun jousting with you here, as your persistent skepticism has helped me clarify my own speculative thinking on these subjects. For my part, I remain open to reevaluation and reinterpretation as new "facts" (not really facts, of course, because it's fiction) continue to emerge as the history of Trek unfolds (both in the real factual sense, i.e. that of the external world the fiction's creators inhabit, and within its internal "continuity"). See you around the galaxy, as we each continue our explorations and investigations of these odd phenomena! At the very least, might we all agree that perhaps you and I are both probably taking this all just a little too seriously? 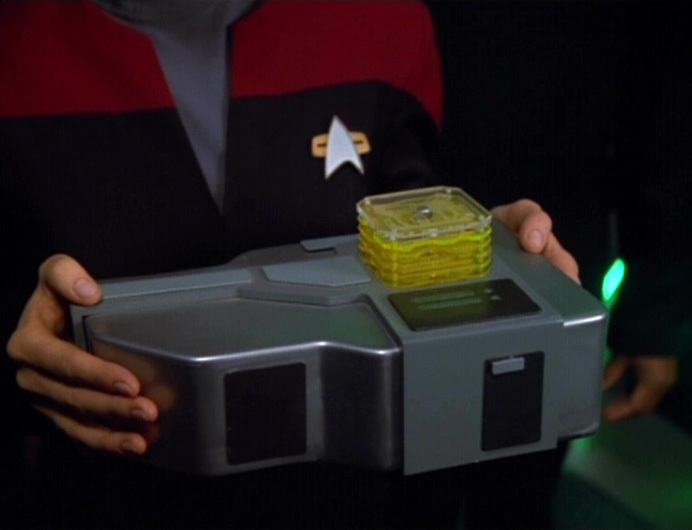 Michael Okuda himself said of his signature interface design that the task Roddenberry set for him was to show that the Enterprise-D would be "so advanced that it would be highly simplified and elegant" by comparison to previous vessels. Agreed. I don't think Klingons have ever really been overused so much as they have been underused. Personally, I loved all the Klingon drama and intrigue in Season One of DSC. They felt fresh again, and yet still familiar (much like the show overall). That they've shifted focus and are following other plot threads in Season Two, whilst not leaving the Klingons cold (and remember, Klingons don't like the cold) by the narrative wayside, is quite all right with me, of course. There's plenty to explore in Star Trek besides the Klingons. And yet, it's a safe bet that the Klingons will always be around in Star Trek, whether in the foreground or the background. They're as much a part of it as phasers or transporters or replicators (or their forebears) or holograms. Sure, you can have a vast and varied cornucopia of Trek without Klingons...but then again, on the other hand you sort of can't, either. (As @Turtletrekker said in another thread, "that's like Doctor Who without the Daleks"!) So you might as well make revisiting them a recurring and developing plot thread. That's what TOS did, what the films did, what TNG and DS9 did, and what DSC is doing now. Feels like Star Trek to me! Alan Roi, Manchester, PiotrB and 4 others like this. May have to borrow Terrell's phaser. ...One thing DSC has added is instantaneously appearing and disappearing characters. In TOS, nobody came aboard and nobody left, unless there was a space station or a starbase in an establishing shot. Or a ship in an establishing bit of dialogue, but they couldn't actually afford to show ships. Oh, and then there was that shuttle business in "Journey to Babel", a rare use of spacecraft to ferry personnel, but the other comings and goings were equally rare so we can't really say shuttle use would have been exceptional there. In TNG, people came and went when there was a preceding shot of the E-D flying in formation with an Excelsior or parked nose-to-nose with an Oberth or an alien ship. In ENT, there was a lot of explicit docking action with all sorts of ships, unimaginable in the more restricted sixties. We have a scene in the very episode where Leyland tells Pike he's sending a liaison. And then Pike tells Burhnam he's arrived. I guess your weren't paying attention. Do you really need a meeting in the transporter room or a shuttle showing up every time? Other series brought in characters all the time and let them go without the establishing shots you demand, and all the time. How, for instance did prime Lt. Moreau appear on the prime bridge after she's been seen in the Mirror Universe is one example from TOS? How did she get on the enterprise? It was never stated. Why? Because it didn't matter then any more than such should things matter now. CommanderRaytas, PiotrB and fireproof78 like this. This is a very unique DSC thing, is what I'm saying. Nothing like this would ever have happened in any of the other shows: the means by which a character would arrive would be carefully explicated. And even explicating wouldn't really help but make DSC its own thing here. In no other show would single characters arrive and leave so willy-nilly. Is Starfleet really sending out entire starships (which, uniquely to this show, are never shown) for this? Or do the characters indeed travel by shuttle (a capacity never used in any of the other shows, not ten fictional years later, not a fictional century later)? You misunderstand (deliberately?). I refer to characters who are stated to have arrived or left, not to characters whose appearing in a scene is not stated to be an arrival (that is, she may just have walked there from her cabin or whatnot). DSC is also infamous for referring to arrivals and departures that could not really have happened. Sarek says he will leave the ship (and, once again, the inconvenient proximity to his foster daughter) as soon as possible in "Brother", and indeed apparently does - while the ship is caught in a life-and-death struggle with that gravity-anomaly asteroid! At which point exactly did he launch his shuttle? What do you mean characters never travel by shuttle? They do it all the time in every series. And what is wrong with a character stating they are leaving? And again, why does it matter to you when Sarek left the ship? He stated his intention to leave the next chance he got. And he's an ambassador, not a crewmember, why is it strange he wasn't involved in the rescue? Why does the specific point when he left matter to the narrative? So Cornwall was on the Section 31 ship that also happened to be chasing Spocks shuttle too? Why does the narrative need her to be shown to there earlier. Having superiors show up by surprise is also not unheard of in the franchise either. Disco might be doing this more often, but to say "this never happened before" is rather hyperbolic. There are plenty of characters who say they are leaving or are assumed to have left in all of the series. Many of them do not explicitly get a transporter room or shuttlebay arrival/send off scene even if many also do. One of the more egregious is in TOS and "The Menagerie" in which the camera pans away from Spock taking Pike in his wheel chair to the transporter room, and Kirk watching on the viewscreen Pike immediately walking away with Vina. What do you mean characters never travel by shuttle? They do it all the time in every series. Interstellar travel by shuttle is unheard of in TOS, so much so that Kirk ends up in deep trouble when even trying to get started. TAS shows this can be done, in a special shuttle that's much bigger than the TOS one - but that's a one-off. And in any case, shuttle travel was always completely explicit. TNG still basically never described an interstellar shuttle trip, just ship-to-shore or shore-to-ship sorties of ill-defined length and with impulse starscapes seen through the portholes. The same shuttles were shown doing warp in VOY so it's not a missing technological capacity. But again, characters traveling by shuttle were described as having done so. DSC having warp-capable shuttles is not a problem or a novelty. DSC having shuttles that are capable of interstellar travel is not a problem even though it's something of a novelty. DSC using shuttles for interstellar travel without mention is the new thing. And sometimes a problem. And what is wrong with a character stating they are leaving? And again, why does it matter to you when Sarek left the ship? Basically every time Sarek leaves the ship, this is at an impossible time. The ship is at warp towards a distant target, or stuck in an Adventure, and still Sarek just slithers away by unknown means. If he left the ship at story-appropriate points, this would be no problem - but it would still be a complete DSC novelty, as the other shows did not involve characters suddenly deciding they wanted to hop off when the ship was underway and when the Adventure was underway. Yet Sarek leaves at story-inappropriate points. Yes, he may go hide in a closet or something, especially when his stepdaughter is at sickbay and in need of a Vulcan hello. But not when he explicates that he's leaving the ship in the middle of a warp ride to go do stuff on Vulcan (and ends up concocting a genocidal plan) in "The War Without", say. Why does the specific point when he left matter to the narrative? Because of the very narrative. If the idea is that the ship is underway to somewhere important or in the middle of something dangerous, detours raise questions, especially if they are to be inferred rather than outright mentioned. Why is Sarek's means of departure immune to the dangers of the day? So Cornwall was on the Section 31 ship that also happened to be chasing Spocks shuttle too? Except she then proceeds to chide Leland for hiding the ship until the last moment. If she were aboard at that point already, the blame is hers alone. This is the new DSC thing: arrivals that don't fit the narrative. In every. other. show, we got "We have picked up X from Y" or "We have rendezvoused with the Z" to explain the sudden presence of a character. Not here. And even burdening the audience with inventing the means of arrival doesn't help when it actually contradicts the other writing on these events. Having superiors show up by surprise is also not unheard of in the franchise either. Except not. In DSC, it's standard. In all of TNG, it never happened. In all of TOS, it never happened. In all of TAS, it never happened. In all of ENT, it never happened. Not a single time. VOY is of course immune to this issue, and DS9 didn't involve a starship that would require active effort to locate and then reach, and didn't keep track of the countless arrivals and departures anyway. But none are shown going missing while the ship is warping from A to B. And none disappear in the middle of a crisis. It just didn't happen in TOS writing, because the writers couldn't fathom the idea of somebody coming or going while a ship (or, say, an aircraft) is underway. And it still didn't happen in TNG, where a big deal was made of arrivals and departures: rendezvous footage or a Captain's Log voiceover was dedicated to such events, because there was a story point to a character becoming available or unavailable. In-universe, DSC is phenomenally bad with travel in general: this season, we really don't know where the ship is, where she's coming from, and here she's going, in any of the episodes. She just gets diverted to engage in one or the other of her actual missions, of locating Spock or making sense of the Red Things. But that's not completely novel: we often found the VOY hero ship drifting aimlessly at the start of an adventure, too. Except we always knew she was making her way towards Earth. Under Pike's command, no such destination is preset. "Obol" is an oddball in that no fewer than three characters arrive (and one soon departs), and we never learn where they came from. Number One seemed to have visited Spacedock: is that where she beamed from? Did Nhan beam from there, too, separately? If they arrived by ship, why two separate ships (or why two separate beamings, tying down this putative ship for an extended length of time for no clear reason)? And why is Reno there? But at least the three mystery arrivals were clustered in this one episode, so one bit of audience rationalization covers it all if need be. None of the other shows had such multiple mystery arrivals - none exactly. There is just too much wrong here to go through. I get it that this is how things work in your head. Its just not what's happened on the screen to the extent you imagine. FYI, Shuttles have had warp nacelles and have been warp capable since TOS. Hythlodeus, fireproof78 and ozzfloyd like this. Weren't Kirk and Co traveling through interstellar space in Metamorphosis and Spock's team in The Galileo Seven? And of course the Shuttle that was chasing the Enterprise in The Menagerie must have crossed into interstellar space as well. The Librarian, Hythlodeus and CorporalCaptain like this. Also "Let That Be Your Last Battlefield," the shuttle that Lokai stole from Starbase 4. Though I think @Timo is overemphasizing the warp shuttle thing, I do think the Discovery characters come and go in very sudden and often odd ways. Sarek's departure in "Brother" was especially strange. Apparently he waits for Discovery to go to a distant, dangerous location, and then zips off in a shuttle? ... or has a possible nearby Vulcan Cruiser come pick him up. They do seem to be all over the place during this time period. A quick rendezvous would only take a minute or two to transport him over.